Forget the fussy traditional version. Our potato classic is a shortcut to creamy flavour right off the barbecue. 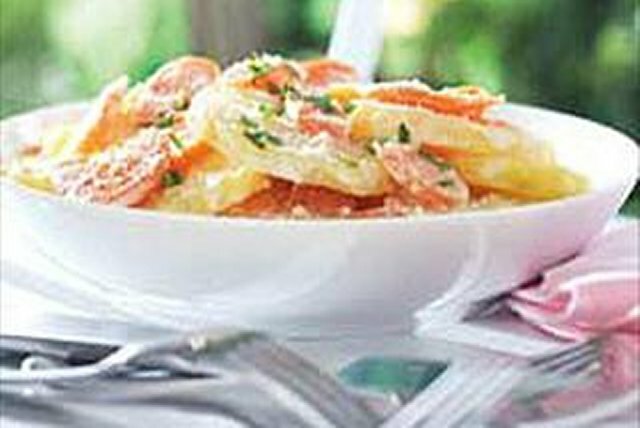 Place potatoes and carrots in microwaveable bowl. Add water; cover with paper towel. Microwave on HIGH 5 to 7 min. or until potatoes are crisp-tender; drain well. Mix Miracle Whip and 1/3 cup cheese until blended. Add to vegetable mixture; mix lightly. Spoon onto large sheet heavy-duty foil sprayed with cooking spray. Fold to make packet, leaving room for heat circulation inside. Place on top rack of barbecue. Grill 15 to 20 min. or until vegetables are tender. Cut slits in foil to release steam; open packet. Sprinkle vegetables with parsley and remaining cheese. Heat oven to 350ºF. Fill potato packet as directed. Bake 20 min. or until potatoes are tender.